An emissary of the elder Yashida, Yukio tracked down Wolverine in the Yukon, bringing him back to Japan to hear the businessman's offer. Yukio is also a highly trained ninja. There was already one Yukio Minimate, exclusive to TЯU, but that was in her plain kimono, while this one is much more casual. She's still got the black boot-fronts, but her legs are painted matte black to suggest her stockings. She's got a skirt piece, and her vest, though merely painted on, is very complex. Nice work on the stripey sleeves, too! Her red hair covers her eyebrows, though stylistically, it probably shouldn't. And while the set includes a sword, it isn't for her. The Hand. They're the Hand. Just call them the Hand. If Fox and Disney can both have Quicksilvers, then they can both have Hand ninjas, too. This figure is functionally identical to the Kenuichio Harada Minimate, just without the Will Yun Lee head, and with a scabbard in place of the quiver. Nice work making their eyes different, though - even with the masks on, you'll be able to tell they're different people. 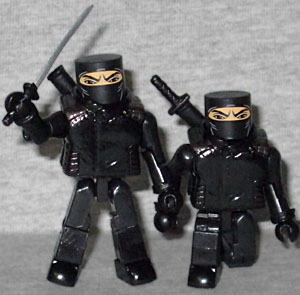 If you buy all of Series 52, you'll end up with two generic ninjas, because one comes with both Yukio and Viper. A face from Wolverine's past, Viper is part of Yashida's team of scientists, and helps implant the device which will negate Wolverine's healing factor. But her intentions are not as altruistic as they appear. Viper really underscores how weird the various Marvel Movie rights are. She's not a mutant, she first appeared in Captain America #110, she was raised and trained by Hydra, she's not a mutant, and yet Fox can use her in Wolverine? Granted, the movie character had almost nothing in common with the version in the comic other than her name and a tendency to wear green, but still. 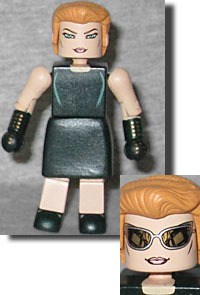 This "Undercover" Viper is in her formal funeral dress, with her long, spangly gloves. The paint even makes an effort at her totally inappropriate high heels. Her hair is a new piece, done up in a complicated twisting bun, and you get your choice of two heads: one with a normal face, and the other with her Tom Ford Nastasya sunglasses. The glasses have... something reflected in the lenses, but darn if I can tell what it's supposed to be. This entry was posted in Art Asylum, Marvel, MMMR and tagged Captain America, Daredevil, Minimates, Wolverine. Bookmark the permalink. Viper is "a face from Wolverine's past?" Was that really from the movie? I don't remember that.